If you are a supplier or a service provider desiring to market your services or products to the cafes or cafe owners, you are certainly at the right place! With the Cafes Executives Mailing List, Blue Mail Media empowers you with a marketing database that is highly accurate and verified. This database encapsulates the contact records of the cafes, cafe owners, and the professionals associated with the cafes around the world. We collect, verify, and update these contact details by using the trusted sources such as Yellow pages, public filings, and government records. Also, we update these records every 60 days to maintain the accuracy of the list. When it comes to targeting your potential as well as existing customers, there’s nothing you don’t do. You invest in hiring the best professionals on your team. You do the all the research before running a marketing campaign. You always keep an eye on what your competitors are doing. And you never forget to measure and analyze the results of your multi-channel marketing campaign. Still, sometimes, you miss reaching the targets. The reason is the lack of accurate data! 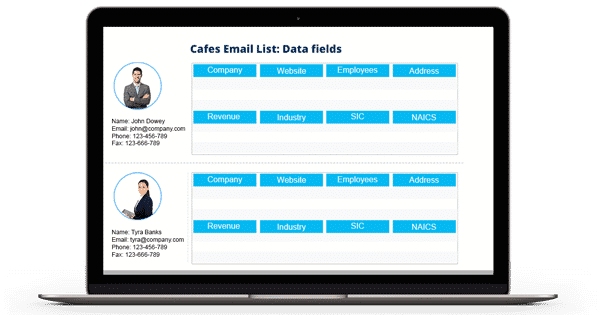 And thus, Blue Mail Media brings to you the Cafes Email Database – an accurate, updated, and verified data repository of contact records. This is a pre-packaged list, and you can also get it customized as per the requirements of your business’ goals, challenges, and needs. Get the Cafes Mailing List now and maximize your revenue!